Penitence has happened on us just as the apple had happened on Newton. Penitence like an apple which goes extinct in the ground or the stomach is nothing, people our missionaries talk to think shrugging their shoulders. Yes, but it's not the apple, it's its motion from the tree to the ground that we have to see, just as Newton saw and comprehended it. 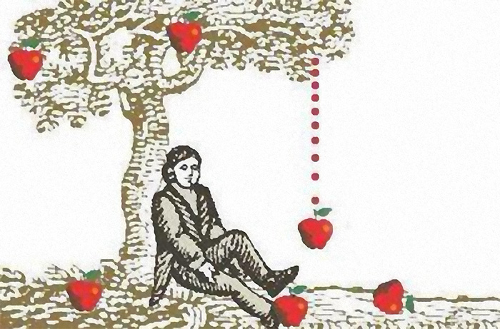 Just as the fall of an apple reveals a force: gravitation, penitence reveals a force: Good. Let's plant the apple trees of penitence! Penitence just as an apple cannot keep its mass and its distance from Earth forever. It hangs from its branch while it ripens, but it will by falling reveal its gravitational force sooner or later. Penitence will cure the world of evil with a force directly proportional to the product of the masses of Evil and Good and inversely proportional to the distance that we penitents will create between them. I just as Pythagoras thought think that all — even the Father, Truth and Life — may be said in figures like in words. and that on the Day (Rev of Arès 31/8), we will raise from the dead and be aware of formulations that are today hidden from us under the unfathomable ignorance that evil has thrown us into. We know that the mass of penitents (Rev of Arès 8/4, 13/4, 27/7,etc.) is to stay a lot weaker — hence its name: small remnant (24/1) — than the mass of the wicked (xix/1-4-23), even though we are unaware of the value of the latter, which may be more impressive than important within the huge vacuum of the apathetic people and the skeptics. So we have to keep the distance between penitents and the wicked as short as possible, proportional to out visibility which will be bigger and bigger with the saints' help and under the Father's Protection (Rev of Arès 37/7-8). IF WE DO NOT INCREASE IN NUMBER FAST, LET'S BECOME MORE VISIBLE FAST! I am going to undergo a heart surgery and there is every chance that it will cure an aortic stricture that has turned hazardous, but the surgery is not completely safe. but if the Father decided that my mission stops now, before I leave I have strongly to stress that penitence is fundamental in our faith and therefore in our mission. It's a plain fact that we are penitents by changing our lives (Rev of Arès 30/11) into good, by harvesting penitents who in turn will harvest penitents, who in turn will harvest penitents, and so on, so that in the end we will give shape to the Truth, that is that the world has to change (28/7). How to changer one's life? I insist that this consists in loving, forgiving, making peace, setting oneself free (Rev of Arès 10/10) from all prejudices against anybody and rekindling one's spiritual intelligence (32/5). But how will this change the world? I lay stress on deculturation, which we will be initiating to get man out of the traditional concept of good and evil. All has been given mankind once and for all. Within this whole lot Good and Evil are potentialities that belong to man, but not to the Father. The Father does not ask us to reinstate Good on earth, like He were His Creator — He is much more than a limited creator, He has created the life energy, but it's man that makes it evil or good —. He asks us to reinstate Good, because He loves us and is upset (Rev of Arès 31/2-5) to see His Child suffering from Evil, which Adam had chosen (2/1-5). Evil can be perfect just as Good can be, Spinoza thought, who added that every reality is perfection, so the perfectest something is the realest. It is the perfection that common people perceive, so that they have ended up telling evil for good and are now very hard to evangelize. Let's make Good real, just as the Sermon on the Mount tells us to do, so that the realest it becomes, the realest existence it has and its Victory will come up on the Day when eternity is back. We as images and likenesses of the Creator can recreate Earth, the minute part of the Universe that we have been granted, Such is the hard labor the Arès Pilgrims have agreed to achieve. Spinoza also wrote, "Man has preferred order to confusion like order might bear relation to anything real in nature." So man imposes upon his race what he calls order: government, law, repressive measures, religion, etc., because he has a passion for Evil, which he compares to our passion for Good, which we have regained. We can thereby realize that penitence is going to change all this too and do much more than create good humanity beside an evil one, it will change the planet from top to bottom (Rev of Arès 28/7).